Kansas City quartet THE BROWNING will release its fourth album, "Geist", on October 26 through Spinefarm Records. 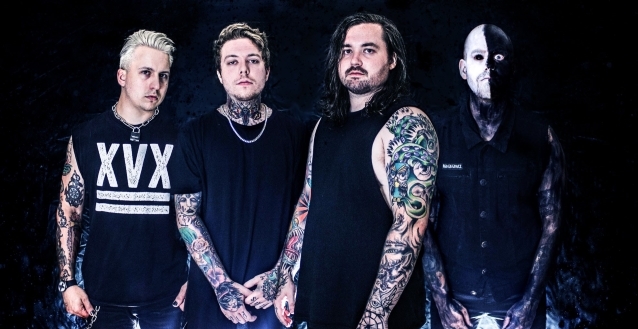 In advance of the release, the band has shared the new song "Carnage", featuring Jake Hill. Listen below. "Our new album, 'Geist', is by far our most dynamic sounding record," said vocalist Jonny McBee. "It has the heaviest, and softest music THE BROWNING has ever written. 'Carnage' is tip of the hat to the classic sound we have but with a ton of intensity and a feature from Jake Hill. When I wrote this song, the only thing I had in mind was to make it as high energy and hyped as possible." Regarding "Geist", McBee continued: "My end goal for THE BROWNING is to be industrial-electronic-rock-metal. For this new album, I knew there needed to be a massive change not just musically for listeners, but for myself. That change had to come from the vocals. I've been working on finding the right voice for three years that's powerful and melodic, but still extremely heavy and emotional. It was a long process, and I documented most of it live on my Twitch channel." As McBee faced myriad personal trials and tribulations throughout 2017, he simultaneously wrote countless songs and livestreamed the creative process on Twitch. Upwards of 100 users might tune in daily to witness his catharsis in real-time. Six of those songs would land on "Geist". However, he quit streaming in order to get really personal. "Structurally, the base of half the album was written on stream," he says. "Since I was writing in front of a live audience, I was giving them what I thought THE BROWNING fans would want to hear — breakdowns, fast synths, and techno. However, I wanted to incorporate different elements. I wrote the rest in private, so I could really focus." Intensely focusing, he spent nearly six months penning lyrics, sharpening his voice in the process. That period yielded a thematic thread that belies a much larger vision. In the end, THE BROWNING don't just pave their own path with "Geist"; they bulldoze it for others to follow.